Congratulations to "Bn100", the winner in Jannine's giveaway. Thank you to all who participated! Thanks for having me on your blog today! 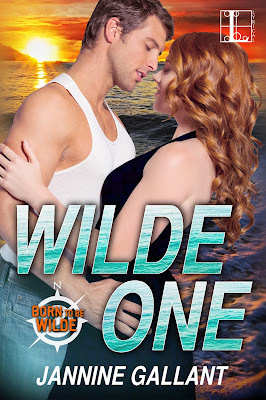 Wilde One is the first book in my new series, Born To Be Wilde. I’m so excited to share a little about it with everyone because this book isn’t your traditional romantic suspense. Don’t get me wrong, there’s plenty of romance. And the villain will give you the creeps once you figure out who this person is, so the suspense component is strong. But this story has an added element that makes it a tad unconventional…and I hope, memorable. Before she could form a rational thought, let alone respond, he lifted the nylon sack containing the tent off the pile and turned away. Pressing a hand to her chest, she focused on breathing as he carried the tent to a flat area and unzipped the bag. “Oh, my.” She waited for her racing pulse to slow. With a single comment, not to mention the flash of heat in his eyes, he’d destroyed every bit of her peace and calm. Ainslee had a sneaking suspicion it was going to be a long night. So, what do you think? Are you willing to give romantic adventure a try? I’m giving away an e-copy of Wilde One in your choice of formats through Enthrill to one lucky commenter. Leave a comment with your favorite book or movie that fits the category for a chance to win. I love adventure and always include it in my stories whether they're sci-fi romance, romantic suspense, or mystery. Romancing the Stone, National Treasure (both), Knight and Day--all great adventure movies with suspense and romance. Best wishes on your new series, Jannine. It's sure to be a winner. Love Romancing the Stone, Diane. My characters actually watch that movie in the 4th book in this series! Thanks for stopping by. Romantic adventure--what a brilliant cross genre! Wilde One sounds compelling, especially for readers who love both those genres! Best wishes for what will surely be success! Thanks, Susan. I do like the sound of Romantic Adventure! Glad you could stop by. Thanks, Nicole. I'm hoping the idea for this series takes off! Shoot, always late to posts! I love the idea of romantic adventure. Romancing the Stone is definitely one of my favorites. Best wishes on this awesome new series. Loved the excerpt! Thanks, Ally. I think the world can use more romance and adventure! A great book to kick off a great series. Romancing the Stone would have to be my pick too. Love these Wilde brothers! Yeah, the brothers are definitely hero material! Thanks for visiting, Margo. Bn100 was my winner. Congratulations, and I hope you enjoy Wilde One. Happy reading!